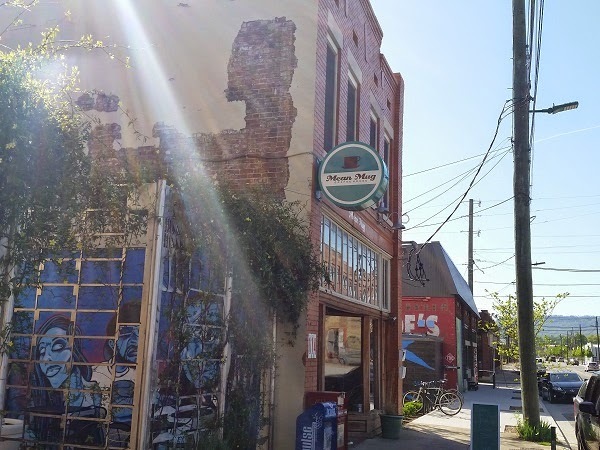 Mean Mug Coffeehouse and The Hot Chocolatier, Chattanooga TN – Marie, Let's Eat! Some days, you just can’t get away from people! We had the most amusing run of luck on our Saturday in Chattanooga. After lunch, we’d gone by McKay to spend some time shopping for books and music. Across the store, I spotted my old friend Darius, whom I’d not seen in ages. Turned out he had tagged along with our friends Matt and Kelley, whom we had seen a little more recently than we’d seen Darius, to sell some of their books and CDs and things to buy more. So we caught up with our buddies for a few minutes and made our way onto our snack at Dub’s Place. After that, we enjoyed lots of running around time and let the boychild bang metal objects at Coolidge Park, and then walked across that fantastic pedestrian bridge south into the city’s downtown. We stopped back by the Moon Pie General Store to load up on orange-flavored double deckers, and then caught the free shuttle back across the river to our car. Had we been thinking about it, we could have planned better and actually taken the free shuttle all the way to our next stops. 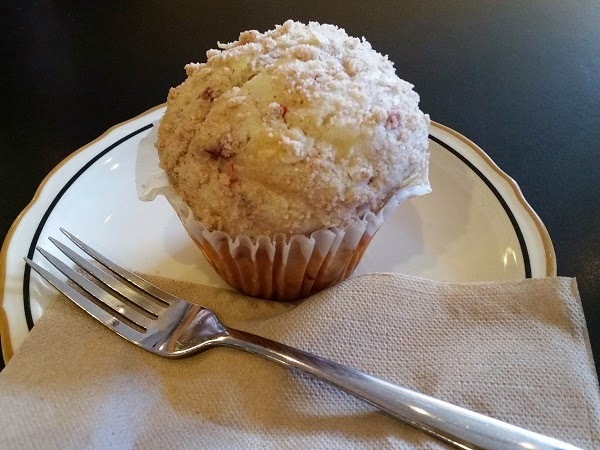 Mean Mug is a terrific little coffee shop, where Marie enjoyed a cup of tea from their deep selection, our son enjoyed a muffin, and I enjoyed the frankly ridiculous mix of music. Whoever decided to put Harry Belafonte’s “Day-O” in between “Boys Don’t Cry” and “Love Will Tear Us Apart” deserves a medal. 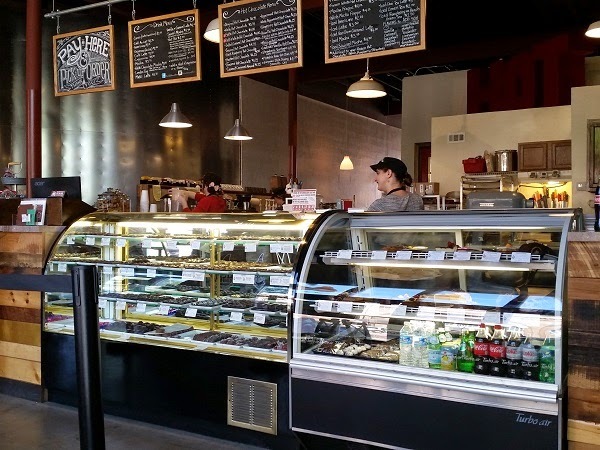 The shop is relaxed and comfortable, and they have a small menu of quiches and sandwiches. They also have a lovely patio, almost the entire space of which was taken by the largest dog I think that I’ve ever seen in my life. Mean Mug is just a short walk around the corner from our next stop, The Hot Chocolatier. As we were walking along, Matt, Kelley, and Darius spotted us from their car and honked. They had just loaded up on chocolates themselves and were on their way out of town! Marie’s verdict was that while these were not quite as amazing as what she gets at her all-time favorite chocolate shop (The Chocolate Fetish in Asheville NC), they were still very, very good and we should have visited years ago. We enjoyed our snacks tremendously, and I was especially taken with the eclair, which was just amazing. Wow, I liked this a whole lot. 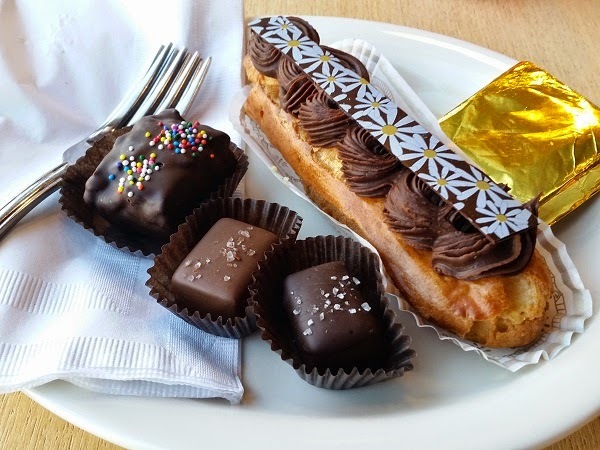 Incidentally, in the picture above, that’s not a little strip of paper lying across the top of the eclair, but a thin chocolate with a bit of floral printing. It’s delicious and wonderful. Wendy and Brandon Buckner opened their business in 2008, and moved to this location about one year ago, catching the crowds of tourists visiting the Chattanooga Choo-Choo across the street. It’s a very nice space for people who’d like to shop and put together boxes to take home or have shipped as gifts, or would like to relax with a couple of treats and a drink. I’m quite glad that I found this place, and Marie’s glad that she has another chocolate option while traveling than she did before! Earlier, when we turned our heads to wave at our friends, we did not notice the building that we were in front of at the moment. We saw it properly on the way back to our car. 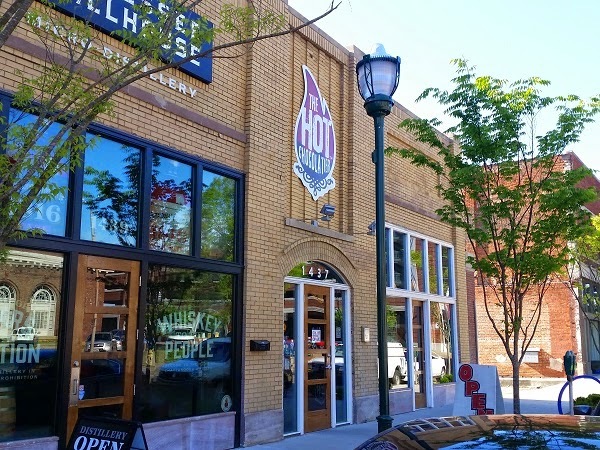 See, next door to Hot Chocolatier is Tennessee Stillhouse, the storefront of the Chattanooga Whiskey Company, and next door to that is an old art deco treasure that, while it’s decaying badly, is still beautiful. Ellis Restaurant, as detailed in this 2002 story in the Chattanoogan, was open from 1909 until a year or two after its founder, Gus Ellis, died in 1976. Some reports say it was 1977, others 1979, but it was certainly during the beginning of the bleak period of Chattanooga’s days, before its awesome rebirth as a destination city by the late nineties. It was not originally at this site, and I’m not sure when it moved here (possibly the late 1940s? ), but it’s been slowly decaying for more than thirty years. 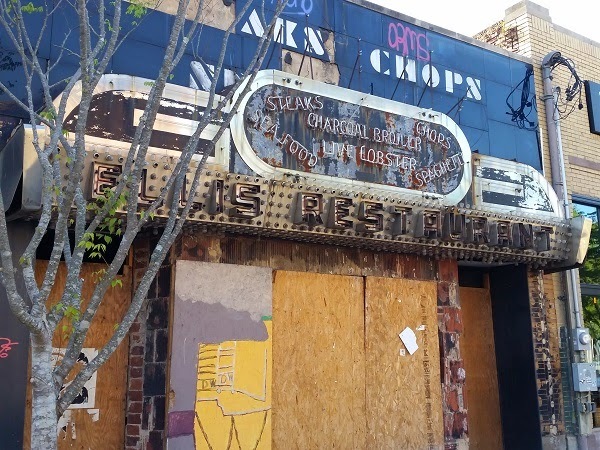 Recently, people have taken an interest in the old facade and have removed part of it for restoration. Missing from the sign today are two vibrant green frogs, and neon tubing that animated them “jumping.” You can watch some of the restoration work on the frogs in this video. 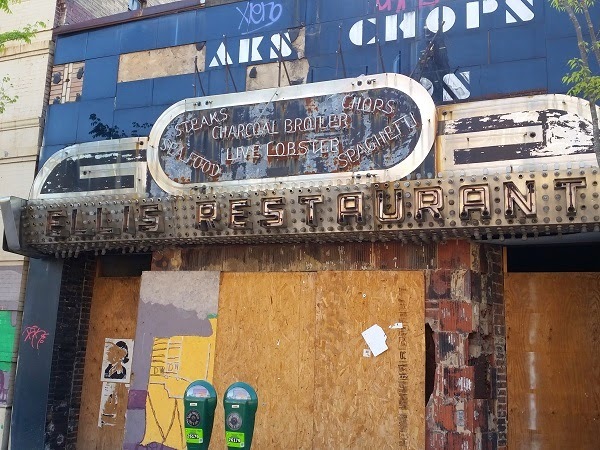 I’m not sure whether the Ellis Restaurant will ever reopen, or whether the restored front will make its way to a museum, but I am very, very pleased that the community wants to celebrate a seventy year-long success with restoration, rather than letting it decay any more than it has. Somebody make sure to let us know when and where we can see this all in its rebuilt glory and we’ll be there. Posted on June 1, 2015 August 21, 2017 by Grant G.Posted in chattanooga, dessert, tennesseeTagged chattanooga, chocolate, dessert, tea, tennessee.